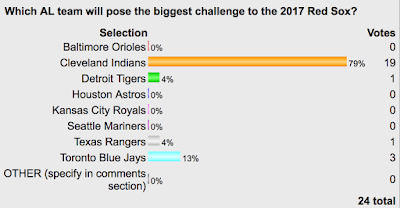 Very early voting in our latest FenwayNation Poll shows that nearly four in five readers (79%) think the Cleveland Indians are the biggest AL threat to the 2017 Red Sox. As the chart shows, The Toronto Blue Jays finish a distant second at 13%, followed by the Texas Rangers and Detroit Tigers at 4% each. Interestingly, the Baltimore Orioles—who actually finished second (tied with the Jays) to the Red Sox last year in the division—have yet to receive any votes. You can still vote in the poll HERE.